Just seventeen minutes of exercise, three times a week, could improve the health of people who have metabolic syndrome, the precursor to diabetes, hypertension, stroke and cardiovascular disease. 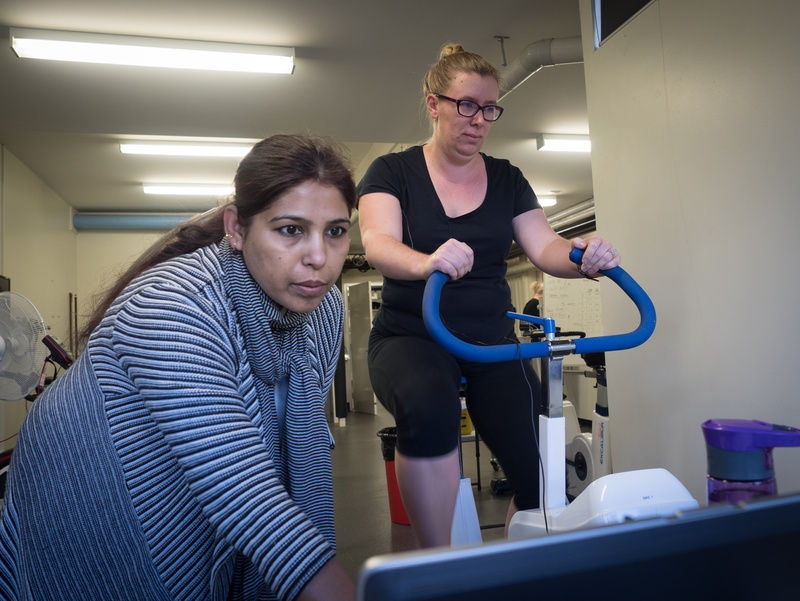 That’s the finding of University of New England PhD candidate Liza Haqq, who said she wanted to identify the minimum amount of exercise people needed to achieve health benefits. “Metabolic syndrome (MetSy) is a cluster of risk factors such as excess abdominal weight, high blood pressure, high blood fat levels and elevated glucose,” Ms. Haqq said. The first line of treatment is lifestyle management. On an average 150 – 200 minutes of aerobic exercise every week is needed to achieve health benefits. The biggest constraint on achieving this goal is time, Ms. Haqq says. As part of Ms. Haqq’s study, she trained participants for 17 minutes, three times a week, for 12 weeks. The training protocol included a minute of high intensity interval training (HIIT) that asked participants to push themselves to 90 – 95 percent of their maximum rate of oxygen consumption. Her study confirmed that short bursts of HIIT are key to achieving greater health benefits, Ms. Haqq said. With only 17 minutes of cycling three times a week, participants improved peak oxygen consumption by 28 per cent. “This signifies a massive improvement in cardio-respiratory fitness and indicates better lung capacity, stronger and efficient heart and more oxygenated blood, which enhances skeletal muscle performance,” Ms. Haqq said. Peak power, the body’s ability to keep performing against muscle fatigue, also improved on average by 33 per cent, signifying an improvement in the body’s anaerobic threshold. The most important measure in relation to MetSy is waist circumference. Fat cells in the waist are directly linked to insulin resistance and any reduction in waist circumference directly reduces insulin resistance. Participants reduced their waist circumference by two per cent on average. Six participants with metabolic syndrome (MetSy) or Polycystic Ovarian Syndrome (PCOS) in women were tested. PCOS was also tested because in 70 per cent of cases insulin resistance triggers an early onset of metabolic syndrome in these women. Ms. Haqq believes that with greater numbers of participants, further confirmation of the benefits of interval training on MetSy would be confirmed.